These papers have generated so much interest that it is fair to say that they have created their own subfield of optical science, what one might call ‘invisibility physics’, and numerous research groups are busy concocting their own invisibility schemes or attempting to construct a Leonhardt/Pendry-style device. It is interesting to note, however, that the study of objects which are in some sense ‘invisible’ is not really new, and in fact there is a century-long history of scientists studying objects which may be considered, one way or another, undetectable. I happen to know a lot about the history of such objects, so I thought I’d start yet another long-running series of posts, this one on invisibility physics. We start today with a discussion of what may be the first paper of this type, written by none other than the remarkable physicist Paul Ehrenfest. Any student of physics is aware of the basic observation that accelerating electric charges radiate electromagnetic radiation: in other words, if the speed or direction of motion of a charged particle is changed, that particle emits energy in the form of electromagnetic waves. For example, radio waves are produced by inducing fluctuating electric currents in a large antenna. When operational, ring-shaped particle accelerators such as the LHC (known as a synchrotron) push charged particles around large circular paths, and these particles emit what is now known as synchrotron radiation. A more mundane example is the low-frequency electromagnetic fields produced by the alternating current used to power all electrical appliances in one’s household. Students of physics are taught, in essence, that “accelerating charges = radiation”. However, in 1910 Paul Ehrenfest published a short paper (“Phys. Z. 11 (1910), 708-709) entitled, “Ungleichförmige Elektrizitätsbewegungen ohne Magnet- und Strahlungsfeld”. Roughly translated*, the title is, “Irregular electrical movements without magnetic and radiation fields”. In this beautiful and extremely short paper he demonstrates, quite conclusively, that Maxwell’s equations allow for the existence of accelerating charge distributions which emit no radiation. It is to be noted that the “correct” model, the Bohr model of the atom, would not be proposed until 1913. Even Rutherford’s discovery of the nucleus would not be unveiled until 1911. 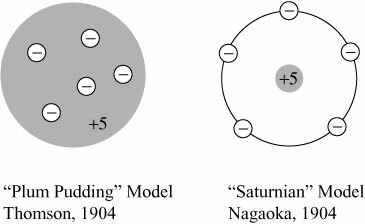 The “plum pudding” model of J.J. Thomson suggested that the atom consisted of electrons moving in a “soup” of positive charge, while the “Saturnian” model of H. Nagaoka suggested that the atom consisted of electrons moving in one or more “rings” around a central nucleus. Both models suggested localized motion, and hence acceleration, of electrons. As we have noted, Maxwell’s equations demonstrate that accelerating charges should radiate, and this in turn would have suggested to physicists of the time that both Thomson’s atom and Nagaoka’s atom must be constantly losing energy and hence unstable. Not incidentally, the magnetic field H must also point in the z-direction, but this would imply the existence of magnetic monopoles, which are strictly forbidden in Maxwell’s equations. Therefore this system also produces no magnetic field! This example flies in the face of “conventional wisdom” that accelerating charges necessarily give off electromagnetic waves. The discrepancy is readily traced to the fact that all textbook examples of accelerating, radiating particles are point particles. Ehrenfest’s example is an extended distribution of accelerating charge, which nobody had previously studied. Now we have a system with rotational symmetry, i.e. it looks the same from any direction. 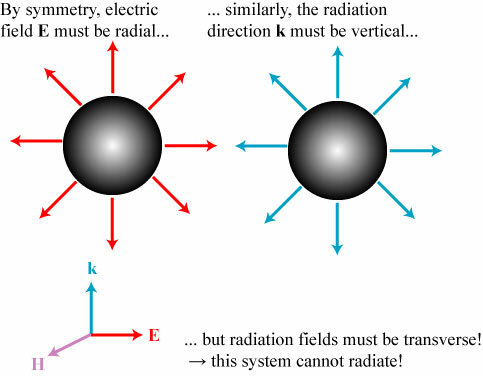 By symmetry, the only direction that an electric field, magnetic field, and radiation field can point is radially outward from the center of the sphere. 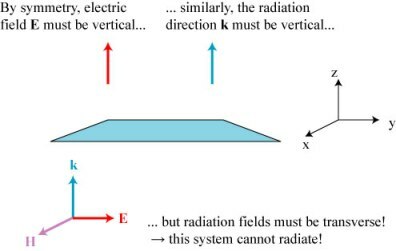 But again, in a radiation field the electric and magnetic fields must be transverse to the direction of motion, so this system also will not produce any radiation, or have a magnetic field! So with two easy-to-understand physical examples, Ehrenfest had demonstrated that extended accelerating distributions of electric charges exist which (a) produce no radiation, and (b) produce no magnetic field. Define a volume A in which your accelerating charges will reside, and an exterior region B in which there is to be no radiation. In region B choose a scalar electrostatic potential such that it satisfies Laplace’s equation, i.e. Such radiationless charge distributions are now referred to (oxymoronically) as nonradiating sources. They represent a form of ‘invisibility’ in that they are electromagnetic systems that should emit light, according to conventional wisdom, but don’t. In later posts, we will also see that there is a strong connection between the physics of nonradiating sources and other types of invisible objects. Ehrenfest’s prescription made plausible the possibility of a stable atom consisting of orbiting or accelerating electrons. Alas for his paper, by 1913 Bohr had proposed his model of the hydrogen atom which could explain the atom’s unusual emission properties. As time progressed, scientists came to realize that ‘loopholes’ in classical physics were inadequate to explain the observed behaviors on the atomic level, and that a new theory was needed to account for all the new and strange observations: quantum mechanics. Ehrenfest’s prescription seems to have been mostly forgotten in the quantum hubbub which ensued. However, other authors extended and/or rediscovered Ehrenfest’s original ideas, and would attempt to apply them to all sorts of problems. We’ll discuss some of these later discoveries, and their applications, in later posts! *by Babelfish and, earlier, by multilingual colleague! This entry was posted in Invisibility, Optics, Physics. Bookmark the permalink. Carlos Stroud’s research group at the Institute of Optics was studying how to make an electron behave “classically” by using a specific superposition of wavefunction states. It seems to me that atoms in such a state should emit EM radiation, but that seemed to still be an unresolved area of research. What do you think? That’s a good question; in essence you’re asking whether the correspondence principle holds for the atom in a high quantum state, as far as atomic radiation is concerned. Another way to phrase it: is the quantum/classical transition of a system’s behavior completely achievable for a single atom, or do classical radiation laws only appear for ensembles of atoms? It’s a bit tricky to decide; I suspect that Ehrenfest’s ‘radiationless motions’ were discarded because, once Bohr’s theory came about, it became obvious that atoms don’t radiate according to a classical interpretation of Maxwell’s equations. We know that an atom releases its energy “all at once” as a photon when it jumps from one discrete orbit to another, and this is seemingly hard to reconcile with the continuous classical radiation theory. Or is it? For an electron in a high-n quantum state (not a stationary one, though), the energy levels are very narrowly spaced. Presumably for high enough n, the electron can shed photons and “dribble down” to lower energy states in a manner that looks very much like classical radiation. For large n, the particle will be accelerating very slowly, as well, so it doesn’t have to radiate very fast or at a high frequency. I’m guessing that such low-energy emissions would be very hard to detect, though. In other words, I’m guessing that the correspondence principle holds for the radiation of high-n quantum atoms, but is tricky to measure. What would happen if you were to rotate the pulsating charged sphere? Presumably you would get a magnetic field, but would this sucker radiate? And what would be the effects of varying rates of pulsation Vs. angular velocity on any EM radiation? Thanks for the clear and interesting paper. An individual piece of charge on the infinite uniform planar sheet “feels” no field when the sheet is at rest. Is it still a zero field on the sheet when it is accelerating? It seems that if there is no radiation the field does not change. If the field does not change, the information that the entire sheet was accelerated is an immediate knowledge for every point on the sheet. Accordingly the default is: if part of the sheet is accelerating – the entire sheet is accelerating. Field will change (with radiation at retarded time) only if not the entire sheet was accelerated. Is this a correct description of the phenomenon? How could you create this senario?…IOW, with area B saisfying laplacian = 0, and time varying E potential inside?? PS. what is convection current density? From a physical point of view, nobody knows: it is very difficult to construct a three-dimensional source distribution that has specified properties. From a mathematical point of view, one simply chooses any function phi(r) to represent the potential inside the area B, chosen such that the function goes smoothly to zero on the boundary of the source; such a function will automatically produce a zero potential outside. The current density/charge density follows directly from Maxwell’s equations. Is there an English translation of Ehrnfest’s 1910 paper? Can you point me to any experiments that test the prediction of no radiation from a charged, oscillating sphere? How does one derive v=(time derivative of grad phi)/(del-squared phi)? Uh, wrong, the “throb” does emit radiation. The inverse-range law means the field can’t be cancelled but within the surface. However there is a range of acceleration that doesn’t excite a spectrum.